Some of our past and present clients. DeLano & DeLano was established in 1998 by Everett DeLano as the "Law Offices of Everett DeLano." In 2002, Dare DeLano joined the firm, and the name was later changed to DeLano & DeLano. Since 1998 the firm has been working with clients in the San Diego area and throughout Southern California on a wide range of environmental and land use matters. DeLano & DeLano welcomes a challenge. We love representing the underdog. Both partners came into the firm with first-rate legal credentials and an unwavering commitment to public interest work. DeLano & DeLano considers no matter too big or too small. The firm has handled issues ranging from an individual dispute between neighbors over property rights to complex toxic tort and class actions lawsuits. DeLano & DeLano works strategically to resolve matters quickly and effectively. DeLano & DeLano often assists groups in building coalitions of organizations to band together to achieve a certain result. DeLano & DeLano employs the hard hitting tactics of a top law firm, while still providing clients with the individualized attention they deserve. We don't spend our clients' money on fancy office space and firm luncheons. 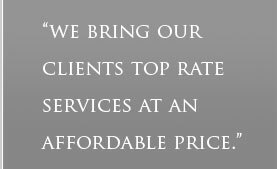 Instead, we forego the perks of big firm life in order to bring our clients top rate services at an affordable price.